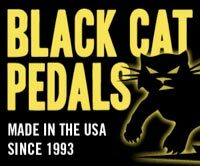 It seems we've given the majority of our attention here lately to things related to Black Cat Pedals, but we've had some increasing activity on the retail end of the FMO Gear Shop as well. Empress Effects, Lava Cables, Moogerfoogers, and Trailer Trash Pedalboards have all been selling very well for us. But the vintage effects are what's really happening — that is our specialty, after all. We have lots of great customers and vintage effects fans from all over the world, but once in a while we get a customer who really stands out. Ben Chapman from the UK bought a few nice vintage stompboxes from us over the past few months this past summer. There's nothing so unusual about that. But Ben has just been an absolute pleasure to work with; always so polite, friendly and extremely enthusiastic in all his correspondence. He always sounds SO incredibly psyched about he pedal he just got, or the one wants to get next. I can't help smiling whenever he sends an email. It's the kind of thing that makes my job fun. Thanks Ben!